How Does a Pre-Validated LIMS Save Time & Reduce Cost? LabVantage recently released an upgrade to LabVantage Pharma, the world’s first (and currently only) pre-validated and preconfigured pharmaceutical LIMS. It is a comprehensive package for pharmaceutical quality labs providing everything necessary to get a validated LIMS up and running quickly. Anyone familiar with LIMS and validation can attest to the potentially lengthy startup times – typically exceeding 12 months. Timelines, of course, are only half of the story. The costs associated with lengthy startups are directly related to manpower – something many pharma companies (especially those with limited resources) would prefer not to spend on ancillary tasks such as LIMS validation for a quality lab. LabVantage’s pre-packaged solution addresses this by leveraging our years of experience implementing LIMS in the pharmaceutical industry. Our packaged Pharma solution has already gone through a full execution of the validation life cycle based on User Requirements, from IQ/OQ/PQ to System Release. 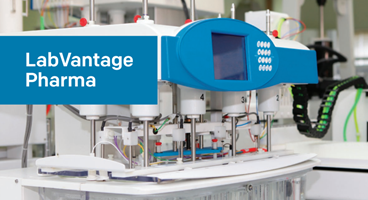 We preconfigured LabVantage Pharma based on industry best practices to support pharmaceutical specific workflows, such as batch management, stability testing, reagents & standards management and barcode label printing. Unlike LIMS vendors who only provide validation test scripts which are rewritten to match the specific configuration, our prepackaged solution covers the entire validation from the customer’s end – providing complete evidence of the validation process for our out-of-the-box (OOB) platform. 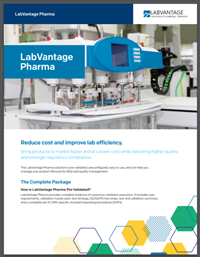 Because LabVantage uses common pharmaceutical user requirements to configure the solution, minimal configuration changes are needed to begin using the system. And by closely adhering to GAMP 5 (Good Automation Manufacturing Practices) guidelines, LabVantage Pharma easily integrates into your existing validation processes, minimizing and streamlining the effort to validate the LIMS. 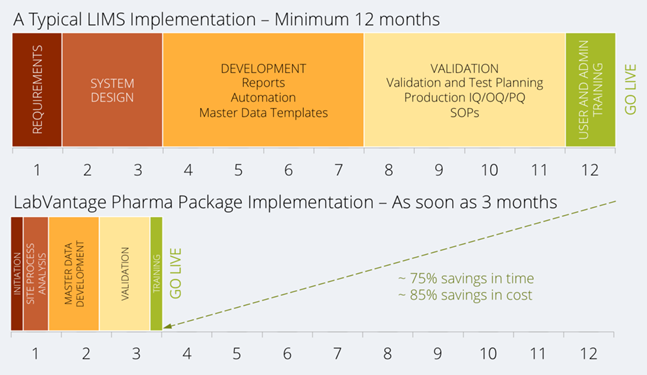 In many cases, pharma quality labs can see up to 85% savings in implementation costs and 75% savings in time. With LabVantage Pharma, implementation doesn’t need to focus on system design and development. Instead, implementation focuses on training the client’s team on the configured solution and helping gather and load the master data needed to operate the LIMS. This can condense the time needed to go live to as little as 90 days. Want to learn more about LabVantage Pharma? Download the datasheet here.